A few weeks ago, I was leaving school to go home. As I pass the gate and say bye to the students, I hear “c’ombole” as one of the students points to my bike. The confused look on my face lets them know that I don’t understand. “Cela boleke“, they clarify. I’m understanding a little better now. One of the students explains c’ombole is the shortened version of cela boleke (pronounced click c-eh-la bo-lay-gay) meaning “please borrow me…/may I borrow…”. In this instance, the student was asking to borrow my bike. The student who explained the shortened siSwati went on to entertain my lamenting about how siSwati changes whenever I feel like I have a handle on it. She explained the concept of rolling siSwati by comparing it to English contractions and various stylistic preferences (that are present when speaking any language). In English, “How are you doing?” becomes “How you?”; “cannot” becomes “can’t”; and “Where are you?” becomes “Where you at?” In siSwati, “uyakuphi” (pronounced oo-ya-goo-pee) becomes “uyaku” (pronounced oo-ya-goo) or “uya” (pronounced oo-yah). No meaning is lost, and the listener understands you want to know where s/he is going. This is not to be confused with “ukuphi…” (pronounced oo-goo-pee) meaning “Where is (a person)?” Sometimes, this gets rolled into “uku…” (pronounced oo-goo) or “uphi…” (pronounced oo-pee). Take for example the phrase, “ufuna ini ku wati” (pronounced oo-foo-nah ee-knee goo wah-tee). In everyday siSwati, this phrase becomes “ufunani kwati” (pronounced oo-foo-nah-knee gwah-tee). Both phrases are asking what you want to know. With these realizations, I decided that I would focus on speaking and listening rather than reading and writing. One of the things that has helped me with this focus is a mobile voice recording app. When I hear a word or phrase I don’t understand, I record myself enunciating the word or phrase several times in siSwati with its English meaning. From time to time, I go back and listen to the recordings to refresh my memory. In that vain, I’d suspect that I’m around the fluency of an average toddler. Maybe a slightly below average toddler. Like toddlers, my subjects don’t always agree with my verbs. Sometimes, I mispronounce things. It’s possible that I might need something explained repeatedly. But eventually, we all understand. My conversations with toddlers and preschoolers are awesome, as everyone understands what’s being said. Sometimes, I can manage a conversation with my gogo, or grandmother. Guest post note: As I don’t drink alcohol, I am not able to authentically speak about the beer culture here in Swaziland. In the interest of sharing as much Swazi culture as possible, fellow Peace Corps Swaziland volunteer and G14 brother Nick McDerrah wrote this guest post. Be sure to check out he and his wife’s blog here. Sibebe is the pride of the nation, and the only respectable beer to drink on a Swazi bus or khombi. Named after a large chunk of rock near Mbabane, Sibebe is the only widely available Swazi produced beer. People may drink Castle or Hansa (two South African beers) but if you want to show pride in the beautiful country of Swaziland, grab a Sibebe. The beer is available in a variety of formats, but the proper way to enjoy this lager is through a large 660ml bottle. One of these bottles will set you back about e15, which makes it a bargain to drink local and support a Swazi enterprise. The larger bottles are also recycled and reused. It’s the beer that keeps on giving! 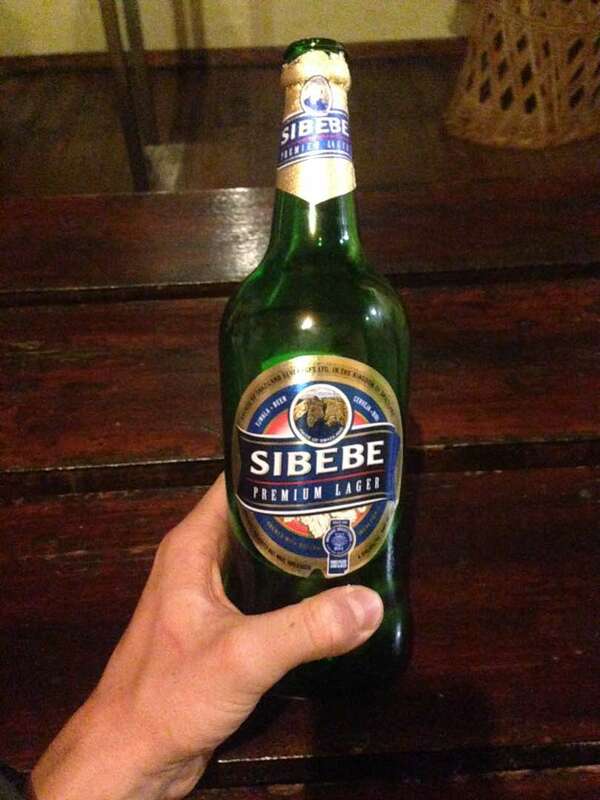 After interviewing others about the exact taste of Sibebe, I received responses like “it’s better than nothing,” or “tastes like piss water.” Opinions differ and obviously one beer can’t make everyone happy, but with limited beer options in country, you take what you can get. With that being said, I do believe that Sibebe is a refreshing, smooth, light beer that tastes great on a hot Swazi day. Add in a fresh squeezed lemon and you have just entered flavortown! The taste is similar to PBR or Coors, but I believe it improves on these American classics. It also has an alcohol level of 4.8%, which is similar to other beers in this category. The bottle is a piece of art, with a gold wrapping around the rim and a nice drawing of Sibebe Rock on the label. The ideal pairing for a Sibebe is a lunch of ‘chicken dust’ or any other braiied meats and pap. Bring some to share for your next braii and you will be the man/woman of the hour! Sibebe is a uniquely Swazi beer that embodies the relaxed, fun loving nature of the people that drink it. It may not differ from many other cheap beers around the world, but you will be glad you tried this Swazi masterpiece. P.S.- Sibebe is pronounced sih-bay-bay.